There are 3 cows that I believe appear in more registered TL pedigrees than any other cows. For some history -- from 1940 to 1972 there was one TL sale annually at the Wichita Refuge, that was it. To attend that sale was exciting. If you did not buy there, you did not have another sale for a year. In 1967 I first saw WR 1005. Chills went up my back viewing her huge horn. She was considered sisters in quality to WR 1052 which we will discuss next week. Both were considered the top TL cows ever. Both were over 50" and the pride of WR. Both cows produced one productive bull that we will discuss later. 1005 was dam of WR 2308. That made WR 1005 the grand dam of Pearl, the dam of Delta Diamond, the dam of Tabasco. It made 1005 the grand dam of Senor Mulege, the sire of Doherty 698. 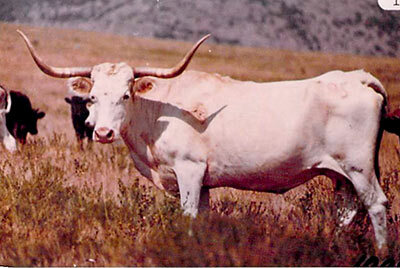 It made WR 1005 the great grand dam of Twist 21, the star of the first Magnificent Seven cows. As a result she is in pedigrees of 3 strong multiple TL lines with great numbers. Every great animal must have something genetically strong in their pedigree. Alligators do not have puppies.